What an interesting first week back we have had! The children arrived back on Monday to discover that our school trophies were missing! In assembly, the police made the case more intriguing when they announced that there were 5 suspects all of whom were members of staff! The children have worked incredibly hard using their Super Skills to carry out a range of investigations, hunt for clues to narrow down the suspects to just one…Mrs Einecker! I am sure you can imagine our relief when, the police revisited the children this morning and they presented their evidence and Mrs Einecker confessed that she did in fact take the trophies but not to steal them! She had simply borrowed them to show other children she teaches how proud she is of all the wonderful children at The Hayes and what can be achieved with hard work and effort. Mrs Einecker had started to leave a note for Mrs Larkham to explain that she had borrowed the trophies when her phone rang, she was distracted and the note was unfinished. Mrs Einecker had planned to return the trophies on Monday morning but when she came into school and discovered it had become a crime scene, she panicked and didn’t know what to do. Thankfully, in assembly our children were able to tell her that it is always best to be honest and tell the truth. We are delighted that Mrs Einecker has apologised, she has learned the error of her ways and returned the trophies, which the children were ecstatic about and the police have confirmed that there will be no further charges! Phew! The children also presented, in assembly today, PERRI. 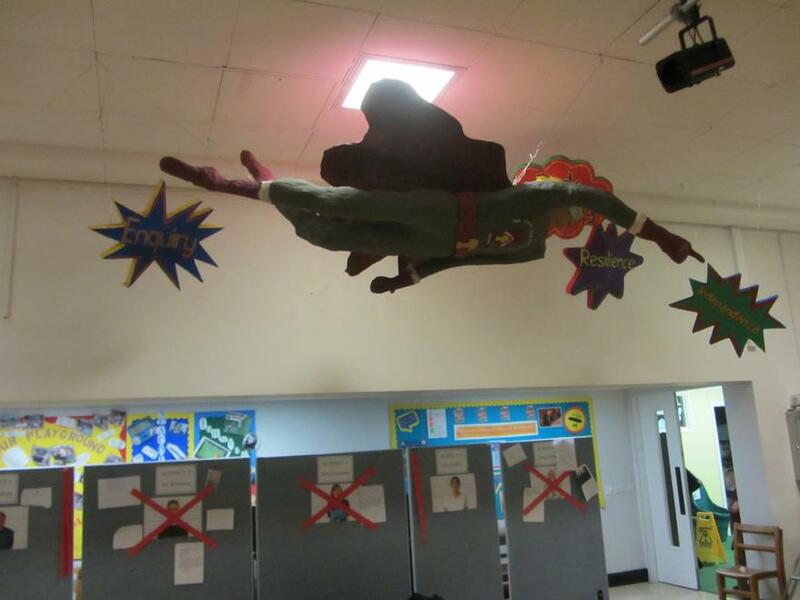 Perri is a larger than life-size Hayes Super Skills Super Hero and is a permanent addition to our school hall. 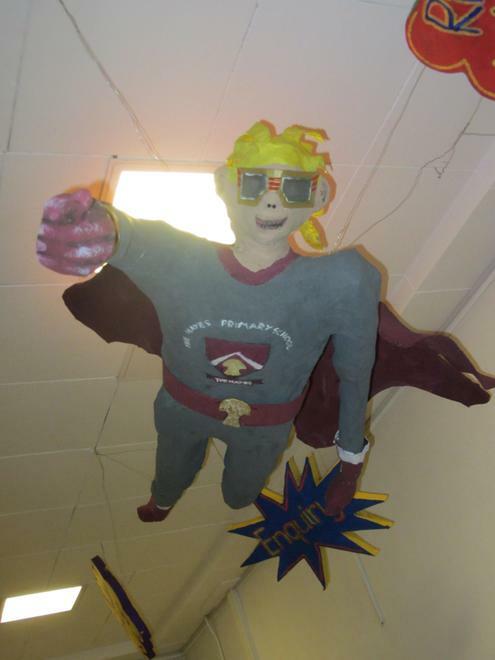 Congratulations to the winners of our Super hero competition, Sophie Youngs, Keir Hearn and Maya Pilbeam. A combination of their designs was put together to help create Perri, whose name reminds us of these important skills: Problem Solving, Enquiry, Resilience, Risk taking and Independence. If you have not seen Perri yet, please do pop into the school hall to admire the children’s incredible sculpture or look out for photos on our school website. On Tuesday some children in Year 5/ 6 will have some Explore Learning Workshops and children in Reception and Key Stage One will take part in their Super Hero workshop. On Thursday some children in Year 5 and 6 take part in a Hockey competition. We wish them the best of luck.